On Friday, May 6th, Eddie ran his Late Model at Lee USA Speedway in the ACT Seacoast Challenge 100 that pitted 41 ACT touring cars against 19 Lee Late Models. The #87 ran to a second place finish in one of the heats for Lee cars and scored a high enough "plus ranking" (based on cars passed in the heat) to start the feature on the Pole. 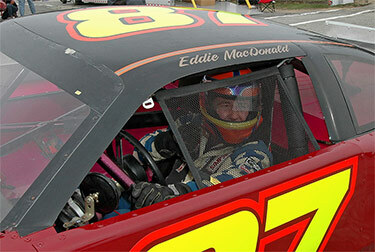 Eddie led the first 24 laps, surving challenges in several restarts. ACT defending Champion Jean-Paul Cyr finally took the lead and Eddie continued run up front until a spin in traffic took him out of contention. Running in the pack after a pit stop, the #87 was caught up in one of the big multi-car wrecks of the race and ended up with a 20th place finish with 81 laps on the board.